For this purpose we call leftist forces all over the world to held actions of solidarity with the liberation struggle of the working masses of Ukraine starting from the May 2. It can be various forms of solidarity actions devoted to problems of today’s Ukraine: picket, march, movement, round table, photo exhibition etc. Our group will contribute to the dissemination of information about these actions in the media. At the May 2, 2014 there was a bloody massacre in Odessa, where according to incomplete data 48 people were killed. Some of them burned alive in the House of Trade Unions. The organizers of the massacre – radical Ukrainian nationalists and fascists who support the regime, established in the Kiev after the coup in the February 2014. Their opponents were the participants of the movement “Antimaydan” opposing to Ukrainian fascism. They belonged to different political tendencies, but opposition to Ukrainian fascism united them. It was they who were the main victims of the massacre on the May 2. Fleeing from the outnumbered crowd of aggressive and armed fascists antimaydan’s activists tried to take refuge in the House of Trade Unions located just at their camp. They were almost without weapons, because they consistently defended peaceful forms of protest. The enemy attacked with Molotov cocktails the House of Trade Unions, and then a fire has started. Fleeing from the fire, people jumped out of windows, and angry Ukrainian fascists beat and killed them on the ground. Fire service deliberately did not go out on the call of desperate people. And when it finally arrived, the fascists did not let them to approach to the burning building. The ruling government of Ukraine is doing everything to hide and distort the truth about this crime. The official list of dead people has not been published yet; the results of forensic examination of the causes of deaths are classified and were not disclosed until now. Neither participant of massacre has been arrested; the state prosecutor’s office deliberately ignores numerous videos proving their guilt. Instead, the trial of the arrested defenders of the House of Trade Unions is organized. The investigation could not find evidence of their guilt, however, despite all the procedural rules, the court refused to set them free. Official propaganda since the day of tragedy has spread lies like “the House of Trade Unions was not protected by people from Odessa but by citizens of Transnistria and Russian saboteurs”, calls these people terrorists and separatists, although the leaders of the Odessa’s “Antimaydan” never called for the separation of the Odessa region from Ukraine. But various supporters of Kiev regime replicate this lie all over the world. Odessa tragedy has become one of the episodes of the civil war against its own people that the Kiev fascists launched last spring. This is not the only event of its kind. The atrocities of the fascists at 9 of May 2014 in Mariupol, massive bloodshed in the Donbass, sadistic treatment of war prisoners, deliberate destruction of vital facilities in the Donbass, the recent excesses of the Ukrainian soldiery in Konstantinovka (Kostyantynivka) – all them are the links of one chain. This is a manifestation of the bloody totalitarian nature of the regime in Kiev, established in the heart of Europe with the blessing of western political leaders. But Odessa massacre became a symbol of this flow of the atrocities. 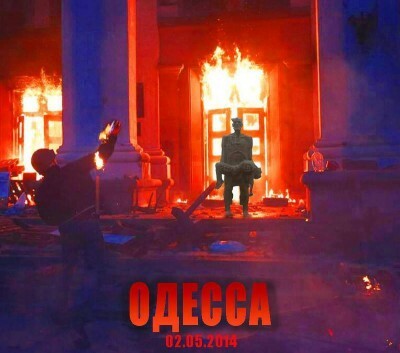 In Odessa, Kiev regime’s political opponents asserted their own rights without weapons, by peaceful means. And they were ruthlessly suppressed with astonishing cruelty and cynicism. The task of all progressive forces of the world is to demonstrate the condemnation and rejection of such methods used towards political opposition. Kiev regime wants to forcibly impose on the entire population of Ukraine its system of values. This system of value totally rejects the Soviet period in the history of Ukraine, it is based on the traditions of Ukrainian integral nationalism, which is the local Ukrainian variant of fascist ideology. These ideas of integral nationalism inspired such figures as Stepan Bandera. For a significant part of Ukrainian society such attitudes are unacceptable. That is why opposition appeared, despite all the repression it has been fighting against the reaction and actively looking for an alternative. But the forces of resistance in Ukraine are split, and some of them are not guided by consistently democratic principles. Some of them receive help from Russian nationalists and therefore think that the alternative to Ukrainian fascism is Russian nationalism. But this is wrong and dead end road. Therefore, the international solidarity of the left forces with the liberation struggle against the Kiev regime will help Ukraine people to see what friends do they have and to strengthen democratic tendencies in the camp of resistance. WHY LEFTIST SOLIDARITY IS NEEDED TODAY? Finally, solidarity of leftist and internationalist forces is important not only for Ukraine. Now we see the rise of right-wing reactionary movements around the world. In many European countries neo-fascists are growing in popularity, the youth joins in their party, they are gaining more votes. Totalitarianism has intensified everywhere and went on the offensive. The civil war in Ukraine – is just one of many episodes of offensive of international reaction forces. But this episode is very revealing. Ukraine – European country, and that’s it in this European country for the first time in the XXI century the fascists entered the government, and the fascist paramilitaries have received legal status in the army and other state authorities. We can resist this attack on the significant for us principles and values only together, combining our efforts all round the world. Therefore, we propose to make the 2 of May as a day of international solidarity in defense of democracy and internationalism in Ukraine. To this end, we urge the leftist forces around the world to held in early May the actions of solidarity with the liberation struggle of the working masses of Ukraine. This can be a picket, march, movement, round table and any other action which would be considered appropriate by activists not indifferent to the problems of Ukraine. From our side, our initiative group will contribute to the dissemination of information about these actions in the media. WE PROPOSE TO MAKE MAY 2 AS A DAY OF INTERNATIONAL SOLIDARITY IN DEFENSE OF DEMOCRACY AND INTERNATIONALISM IN UKRAINE. TO THIS END, WE URGE THE LEFTIST FORCES ALL OVER THE WORLD TO HELD IN EARLY MAY THE ACTIONS OF SOLIDARITY WITH THE LIBERATION STRUGGLE OF THE WORKING MASSES OF UKRAINE! This is a tragic event on the Victory Day in that city. On the eve of the national day, the police – that previously had taken the side of the people – was instructed by the Kiev authorities to prevent, by all means (even opening fire at the demonstrators) the planned, traditional march of the citizens in that day. The police refused to do that. Then the junta’s army suddenly intruded the city with tanks, military cars – and the tanks opened fire at the police station of the city. The building was destroyed and burned out as a result of the mortar shelling – with twenty policemen burning inside, alive. Meanwhile, the completely bewildered soldiers started to run on the streets, to and through, opening fire at all peaceful citizens, walking on the streets. They intruded, for example, into a beer tent, opening fire on all the guests sitting there. Three of the unfortunate clients were shot dead, three others were seriously injured. Ultimately, on 13 June, Mariupol was captured by the junta. (There were pictures showing US mercenaries, fighting alongside with the Ukrainian fascist brigade of “Azov”). A town just 60 kilometers from Donetsk, held by the Ukrainian army. An accident took place on a busy street of the town, when a Ukrainian soldier (who subsequently turned out to be drunken), having lost his control over his armored car, at a great speed run on the sidewalk, killing a young mother with her 12 years old daughter. The infuriated citizens immediately started a revolt against the Ukrainian army. The revolt was toppled to the next day, only.